This is probably my favorite of the three Bishop/SCU -- Fear trilogy set. There is a lot more anticipatory “who dunnit?” going on in this book than there had been in the previous two. On top of that, I actually ended up feeling quite anxious for Riley to reclaim her lost memories and figure out what the heck was going on. Riley Crane wakes up in a beach house on Opal Island, her arms and her clothes covered in dried blood and weeks of her memory lost. Upon contacting her boss, Noah Bishop, she learns that she had gone on an unofficial assignment under the guise of being on vacation to investigate a string of plausible occult occurrences. As a specialist in the occult, Riley has more to offer in this unofficial investigation than simply her psychic abilities, though there’s not doubt that being psychic has always given her an advantageous edge. It doesn’t take long for her to realize that a lot of uncharacteristic things had happened to her while she was on Opal Island, including taking a lover within days of meeting the man. Her Swiss cheese memory appears in random fragments, but nothing tells her what she needs to know the most: What she may have uncovered on Opal Island, why her memory is gone, and why her psychic abilities have become AWOL. And then, with a gruesome murder, possibly linked to an occult ritual as well as finding out that her missing psychic abilities and memory might have to do with being Tasered at the base of her skull, Riley knows she’s got a limited time to find out what happened to her as well as weed out those she cannot trust and find out who she can trust. With the rest of the SCU agents scattered all over the country covering other cases, Riley knows that she’ll be going it alone with this investigation. And no matter how insistent Bishop is about recalling her to Quantico, Riley is equally reluctant to walk away from this mystery and a murder that she may or may not be involved in. And then there’s the intense, mysterious Hazard County District Attorney she has supposedly started a relationship with, but cannot even remember the first time they met. Knowing she wouldn’t have gotten so involved with Ash Prescott if she didn’t fully trust him, she still can’t help the doubts that keep surfacing. The ninth installment of the Bishop/SCU paranormal mystery series actually takes a little twist for the majority of the book and I kind of liked it. While the characters constantly reference the paranormal, Riley’s psychic abilities, and the like, Riley actually spends a good amount of time without her psychic abilities; and so the murder investigation is reliant purely on her own skills as an FBI agent as well as how much knowledge she has accumulated over the years on serials and the occult. It seems like sort of a “Hey, just because we’ve got psychic abilities doesn’t mean that’s all we have” type of shout out. That the SCU agents are just as good at investigating any case without that extra edge. 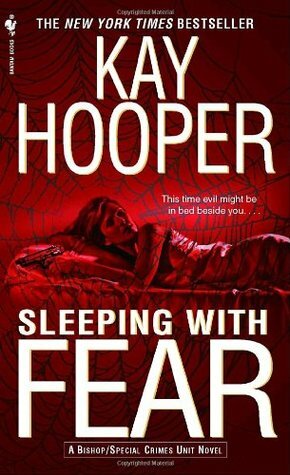 Sleeping With Fear was definitely another page turning Romantic Suspense with the continued forward progress as well as the looming mystery driving one to physically WANT to finish reading the book. After all, something happened to Riley and something is continuing to happen to Riley and we, as the readers, desperately want to know what that something is. So I definitely appreciate the sense of mystery, of the unknown throughout this entire storyline. Because not only is Riley trying to help investigate a murder, but she’s also trying to investigate her missing memories, all while trying not to let on that anything is different about her. Honestly, it’s quite the talent and I would have almost thought Riley was a bit too efficient at keeping her cool and fooling everyone else. But the way in which she maneuvers herself is frankly quite clever. In fact, she might be one of my favorite SCU main female characters now. As for Ash, the love interest… I can’t say that he didn’t stand out, but at the same time I can’t quite say that he did. He was sort of... just there, in a significant role, but he wasn’t outstanding as a main character. Since Riley pretty much drove the entire show, I’m not really complaining, because it worked. On the romantic front, while we don’t get to see the two of them fall in love with each other--a part of Riley’s Swiss cheese memory--we still get the feeling that a lot of high-handed “Fated to Be” stuff was going on in the background. Although very little is stated on that front except for the fact that Ash and Riley were drawn to each other, started their relationship off on attraction and lust, then ended up falling in love. All of that is backstory that we only get to see the characters talking about. But seeing their simmering chemistry in the present state (sans memories on Riley’s part) was not bad. A little deliberate, as it seems Kay Hooper is wont to do with all of her characters, their actions, and actions surrounding the characters, but I’ll take it. At the very least, the murder mystery aspect was done very well and story progression just as excellent. This is probably the more exciting of the three Fear trilogy books in the Bishop/SCU series. While the ending was a big curtain call of a strange conclusion--with some left-field revelations as well as some necessity to suspend disbelief, even for a book about psychics investigating murders--it tied together just fine. Very enjoyable, very suspenseful. And while I’m only half sure I understand the purpose of the flashbacks to Riley’s previous investigation of a serial murder, I thought it was a nice touch to the atmosphere of the storyline, if nothing else. Though we’ve set up a pretty good atmosphere already, what with a deliberate and obvious exposition using Bishop and fellow agent Tony Hart to point out all the people around Riley who may be potentially harmful to her, but being ultra vague about it. Oh yea, and nothing beats waking up covered in dried blood with a block of memory missing. The only thing that bugs me about the Bishop/SCU books at this point is the too vague “universe” and “fate” and “evil” being the go to answer for almost all the questions. I really have liked all the attempted “scientific” twists on explaining psychic abilities, even if it’s a stretch. But then turning around and blaming an all-encompassing evil for certain grisly acts, or leaving the explanations of the unexplainable up to a simple “the Universe has its plans” is too big of a cop out for me to accept. Sure, there is the ultimate culprit of the murders in some of the books, but others stray too far to using a powerful evil presence as the deux ex machina and it irks me a little bit. Nonetheless, the books in this series continues to intrigue me and I look forward to the next trilogy subset in this ongoing Bishop/SCU series.